Today, total March madness! Rain beating against the windows, tree branches waving, it feels as if things will never be normal again. But one thing is happily normal again! I am over this bug that I had. Rejoice with me! I do not like to write about it when I am sick. I am afraid it will be a drag on people and also I do not like to admit weakness. There have been times I have successfully hidden entire flus from Howard, I am proud of that. No. 1 there is that thing about not wanting to appear weak. And No. 2 I am afraid if he gets sick too he will blame me. When I die no one will know it for weeks because I will be trying so hard to look as is I am just asleep. Anyway, this morning. Now that I am with it again I have to tell what happened to me at Mass yesterday. Well, after Mass. My one friend at Mass, his name is Bill, and Bill kind of looks after me at the Latin Mass. He is always giving me literature and stuff. Yesterday he gave me an ancient Kyriale. A Kyriale is a Catholic music book. This is a book full of the medieval chants we do at the Tridentine Mass and being a geek and a nerd I will treasure these chants and practice them in the car. This Kyriale was printed in 1953 which, automatically, I did the math and figured out that Leonard Pennario would have been 29 years old. Why do I do that? Standing in the back of the church I realized I was doing that math and I could not help it. Perhaps Pennario used this particular Kyriale! You never know. Back to my story. Bill also gave me another book, a hard-cover blue hymnal. It has all these square old hymns in it that I love. Like "Soul of My Savior," which we sang yesterday. And "Daily, Daily Sing to Mary." Ancient chestnuts you never sing these days at normal Masses. And here is where things get good. The hymnal was put out by the Society of St. Pius X. That is this society I mentioned the other day under 10 Things I Do Not Understand. They have been in the news a lot these days because one of their people is apparently this Bishop Williamson, who has become famous for denying the Holocaust. Every group has a kook and the Society of St. Pius X's kook is Bishop Williamson. That is the way I understand it anyway. As I said, the Society falls under the category of 10 Things I Do Not Understand. Here is a picture of Bishop Williamson. Anyway. You can guess what happened next. As I am thanking Bill for the hymnal I open it up and guess who wrote the Foreword? I started laughing. "Bill, look!" I said. "Look who wrote the Foreword to this book!" Poor Bill. I do not think he had realized that Bishop Williamson had written the Foreword. Bill's wife came over and she started laughing, too. We could not get over it, Bishop Williamson's name in this book. 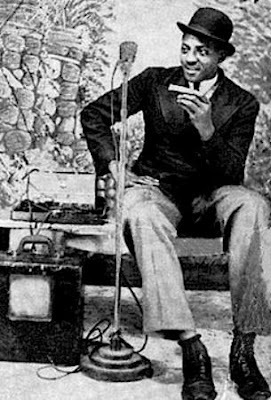 What about Sonny Boy Williamson? He is one of my favorite bluesmen. That is Sonny Boy Williamson pictured at the top of this post. You cannot have too many pictures of him! Omigosh. Here is a video I never saw with Sonny Boy playing harp with Muddy Waters. What a sweet performance that is! So low-key, for Muddy Waters. Usually you do not hear "Got My Mojo Working" like that. Is that Willie Dixon on bass? These Monday posts! They do ramble. I will say this: It is going to be a long week. But at least I have my health back. Yep, that's Willie Dixon. The guitarist is Matt "Guitar" Murphy and I think, but can't be sure, that the piano player is Otis Spann and the drummer is Bill Stepney. I'm betting this is from the 1963 European tour a.k.a. "American Folk Blues Festival". Mary, that's not Bishop Williamson. 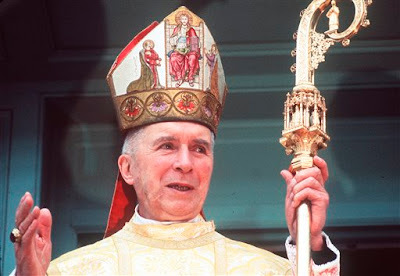 That is Archbishop Marcel Lefebvre. Mary, I am very sorry to hear you were not feeling well, that is not good at all!!!! Glad you are better though for sure. As far as the kook writing the forward, although he may be a kook, he may have still written a good forward possibly? I am sure it did have to be quite entertaining though to discover that.